This category is reserved for companies that specialize in rebuilding antique, vintage and classic car mechanical components, usually associated with the drivetrain. This will include the engine and related components, the transmission and/or transaxle and transfer case, the clutch or torque converter, driveshaft, differential, axles, brakes and suspension. In other words, everything that makes a vehicle stop and go! The following companies specialize in repairing engines, transmissions, transfer cases, driveshafts, differentials, real axles, brakes and suspension systems for brass, antique, vintage and classic cars, hot rods, muscle cars, trucks and vans, motorcycles, motor homes and trailers.If you have a concern or comment about a listing please contact our webmaster@antiquecar.com. http://www.PowertrainProducts.net/: PowerTrain Products ships parts nationwide, five days a week, from their 10 different warehouse locations to insure that you receive your replacement product as fast as possible! Their knowledgeable staff has more than 75 years of in-house experience, exclusively in the replacement drive train industry. http://www.antiqueenginerebuilding.com/: Antique Engine Rebuilding is owned and operated by Richard Fallucca who has been rebuilding Model A and B engines since 1975. He knows old engines and is a master at rebuilding the inserted styles used in the Model A and B Fords. His shop is in Skokie, Illinois, and has a 4,000 square foot machine shop like no other. Richard has rebuilt many engines for museums and movies to be cherished by both restorers and drivers. He will be happy to discuss partial jobs, short blocks or complete Model A and B Ford engines. http://www.babbitt-bearings.com/: Babbitt Bearings is the Aldrich Engine Rebuilding shop who specializes in antique engines that use babbitt bearings, which includes antique and vintage trucks, motorcycles and boats. Shawn Aldrich knows all about engines and promises a fast turn around for most jobs. He is located in Willington, Connecticut, and will be happy to discuss your needs over the phone. 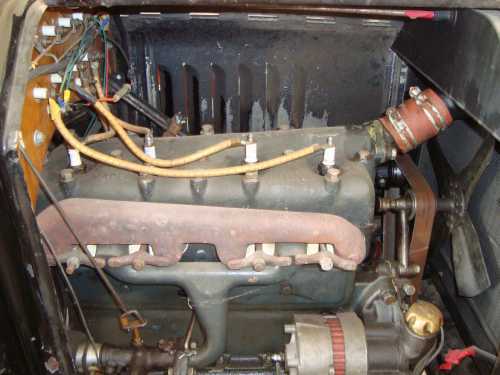 http://www.handhantique.com/: H and H Antique specializes in 1928 to 1932 vintage Ford engines. They have been in operation since 1972 and it has been a family business, operated by the Hermans, for three generations. Mike Herman specializes in early flathead engines for racing applications but they will work on most any early Ford engine. http://www.radiator.com/: Radiator.com has over 60,000 radiators and ac condensers in stock for most all makes and models of antique, vintage and classic cars and they are built to OEM specifications for fit and quality assurance. They are an Internet leader in radiator sales and offer a low price guarantee and a one year or lifetime warranty on all their parts. They have over 200 locations in the United States to facilitate same-day delivery and they work with over 300,000 independent radiator shops to help resolve your needs. You can order and pay for your radiator over the phone and their knowledgeable staff will answer your questions about care and installation. Give radiator.com a try the next time you need a radiator. http://www.thebrassworks.net/: The Brass Works manufacturers and sells brass components such as gas tanks, lights and heater and radiator cores for most any antique, vintage or classic vehicle. They specialize in making or repairing radiators with honeycomb, cartridge, square tube and round tube cores for both show cars and daily drivers. They are located in Paso Robles, California. www.autoaironline.com/: Auto Air Online offers new and remanufactured OEM (Original Equipment Manufactured) and aftermarket auto air conditioning parts at wholesale prices to the public and automotive repair shops. Their inventory includes complete a/c installation kits, air conditioning compressors, accumulators, condensers, clutches, evaporator cores, expansion valves, orifice tubes, receiver/driers, blower motors, cooling fans, hose assemblies, relays, switches and any other auto air conditioning parts you could possibly need to repair most automotive air conditioning systems in antique, vintage and classic cars and trucks. They have complete air conditioning installation kits and most anything else you would need to repair or replace a/c components. www.buy-steering.com/: Buy Steering offers a full line of steering racks and steering boxes for all makes and models of classic cars, trucks and SUV's. They sell new, remanufactured and rebuilt car steering racks and gearboxes and all of their parts come with a full warranty. Everything listed is in stock and ready to ship and they have tens of thousands of parts in warehouses throughout the United States. No one can match their selection of components and their prices are low and their shipping is free -so why not give them a try? You can contact them here: Sales@buy-steering.com. http://www.larescorp.com/: The Lares Corporation specializes in remanufactured steering components. They have been making steering system components for antique, vintage and classic cars for the past 25 years and are now one of the largest companies doing so in the United States. They pride themselves in offering technical expertise, integrity and friendly service to every customer. They are located in Cambridge, Minnesota. http://tbtrans.com/: T and B Transmission is a manual transmission repair shop, located in Deer Park, Washington. They have been in business for over 30 years and will fix yours or sell you a new manual transmission or transfer case. They have an extensive inventory of rebuilt transmissions ready to go and they also carry thousands of new and used parts. They will ship to anywhere UPS goes. http://www.transmission-repair-shop.com/: Transmission Repair Shop is an automatic transmission repair shop, located in Orange Park, Florida. They have been offering quality transmission service and overhauls for over 20 years at the same location and will work on both foreign and domestic transmissions from cars, trucks and SUVs.